When v is positive, the source is moving directly away from the receiver and fR is always less thanes; when v is negative, the source is moving directly toward the receiver and/” is greater than. The qualitative effect is the same as for sound, but the quantitative is different. A familiar application of the Doppler effect for radio waves is the radar dev . mounted on the side window of a police car to check other cars’ speeds. The el magnetic wave emitted by the’ device is reflected from a moving car, which acts moving source, and the wave reflected back to the device is Doppler-shifted in frequency. The transmitted and reflected signals are combined to produce beats, and the speed can be computed from the frequency of the beats. Similar techniques (“Doppler radar”) are used to measure wind velocities in the atmosphere. The Doppler effect is also used to track satellites and other space vehicles. In Fig. 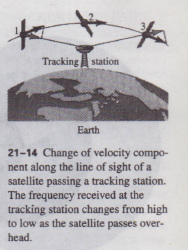 21-14 a satellite emits a radio signal with constant frequency Is’ As the satellite orbits past, it first approaches and then moves away from the receiver; the frequency IR of the signal received on earth changes from a value greater than/s to a value less than/s as the satellite passes overhead. The Doppler effect for electromagnetic waves, including visible light, is important in astronomy. Astronomers compare wavelengths of light from distant stars to those emitted by the same elements on earth. In a binary star system, in which two stars orbit about their common center of mass, the light is Doppler-shifted to higher frequencies when a star is moving toward an observer on earth and to lower frequencies when it’s moving away. Measurements of the frequency shifts reveal information about the orbits and masses of the stars that comprise the binary system. Light from most galaxies is shifted toward the longer-wavelength or red end of the , an effect called the red shift. This is often described as a Doppler shift ring from motion of these galaxies away from us. But from the point of view of the theory of relativity it is something much more fundamental, associated with the ‘on of pace itself. The most distant galaxies have the greatest red shifts because light has shared in the expansion of the space through which it moved. Extrapolating this expansion backward to over ten billion years’ ago leads to the “big . From this point of view, the big bang was not an explosion in space but expansion of space itself.